Play is a purists freestyle board. The Polish slopestyle champion Piotrek ‘The Aviator’ Tokarczyk rides it and says he wants no other. Why? 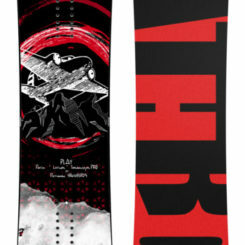 Because he helped design it to meet his demanding needs as a pro snowboarder. He chose the flex, the pop, shape and profile to ensure the Play won’t let him down on bigger jumps, or when jibbing – it won’t let you down either.